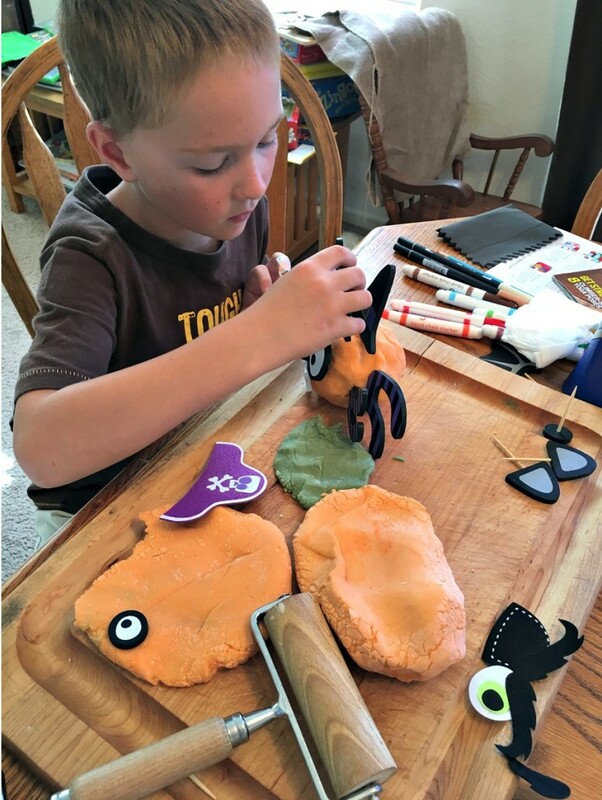 Making homemade playdoh was on our summer bucket list and since we are now into autumn I thought we needed to cross it off our list! All of the stores are now carrying the fun fall decorations and it was easy to pick up some craft supplies . We had a great time making our homemade playdoh pumpkins. I used Martha Stewart’s homemade playdoh recipe with a couple adaptions. It is our Kindergarten teachers favorite recipe and it lasted the whole school year which is amazing. 1. In a medium saucepan, mix together the 2 cups of flour, salt, cream of tartar, and water. 2. Cook uncovered over medium heat, about 5 minutes. Stir constantly until the dough is formed. 3. 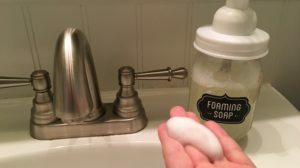 As I was stirring the dough, first with a spoon and then kneading it with my hands, I kept adding more flour until it was no longer sticky and became the consistency I wanted. 4. Divide the dough thinking about how many colors you’d like. I wanted most of the dough orange for the pumpkin with a little left aside to make my stems. Green would have been ideal, but I didn’t have that so ours is a mix of orange and blue and think it came out nice. Add drops of food coloring to each portion and knead the color into the dough to distribute it evenly. 5. Store in a plastic bag or airtight container. It should stay nice and soft for a long time. Guess where I found the cute accessories for our pumpkins? Target dollar section of course! I was also roaming around Amazon and found these which I think would work great too – Foam Pumpkin Stickers or Character Pumpkin Push Ins (which are definitely reusable!) like Star Wars, Disney, Mr. Potato Head, etc. Or use what craft materials or misc items you find at home. Buttons, stickers, yarn, felt, sticks, sequins, pom poms, wiggle eyes, plastic spiders. For the mummy just use good ol’ gauze. 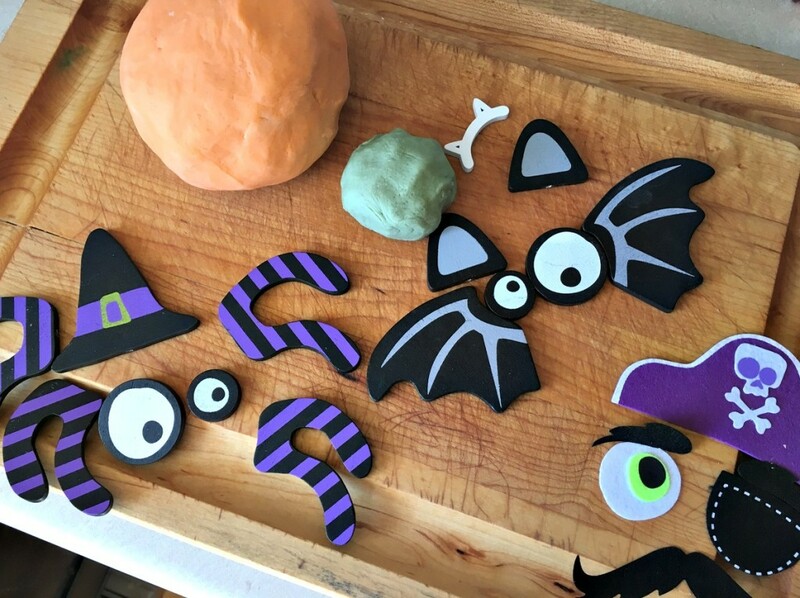 Not only will the kids love to knead the dough as you are making it, but how great is to put all of the pieces on to create your pumpkin characters? The possibilities are endless! Get out the rolling pin because the kids always like that. And use toothpicks or 2-sided craft tape roller (which is usually easy to remove) to help hold in your objects. Hours of fun! 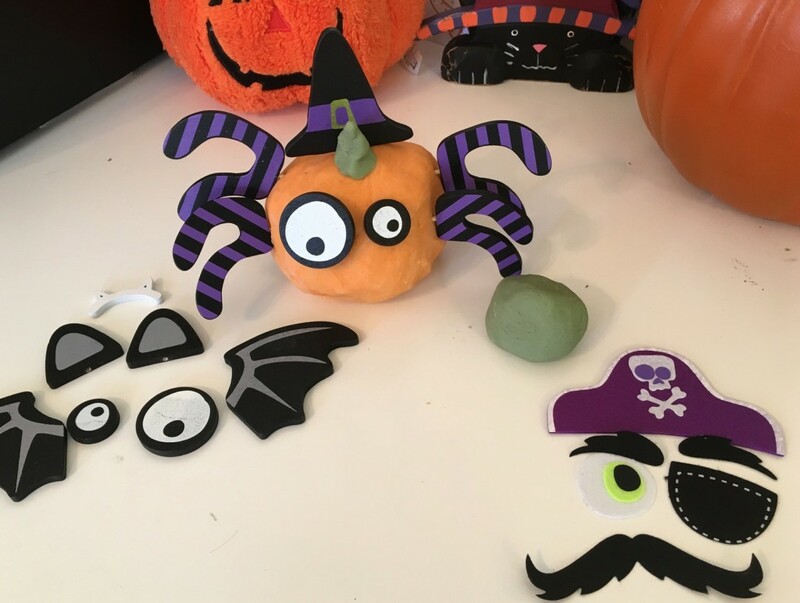 Are you ready to make homemade playdoh pumpkins with your family? For more pumpkin fun check out our Pumpkin Popcorn Balls! 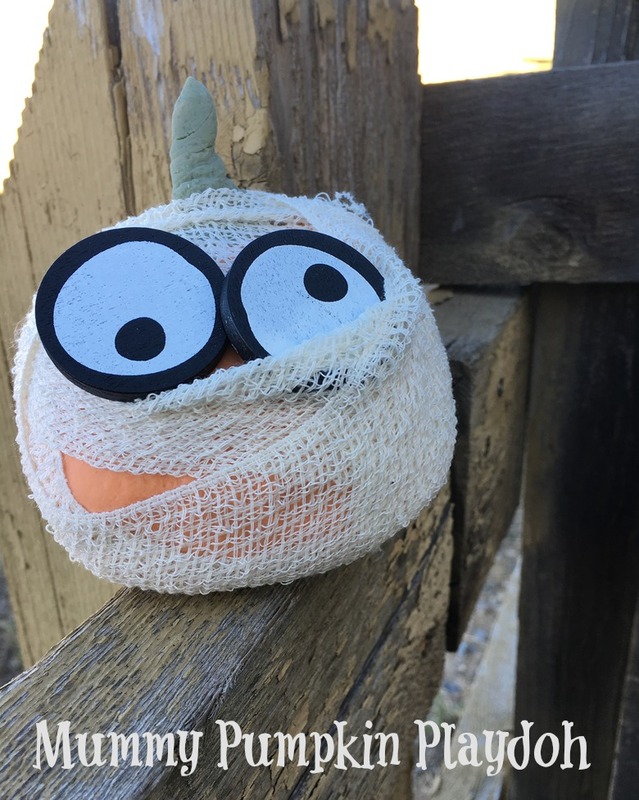 WIN a spider and mummy pumpkin kit! Links may be affiliate. This giveaway will end on October 10, 2016 at midnight MST. Winners will be drawn via rafflecopter. Once a winner is drawn I will contact them and they will have 48 hours to reply before I draw a new winner. Giveaway is open to anyone in US and you must be 18 years of age or older. Giveaway not affiliated with Facebook & I release them of liability. Winner will be posted in the rafflecopter widget. 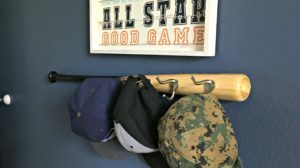 My son would love to do this. Thanks! My grandsons would love to make the spider pumpkin. How cute! 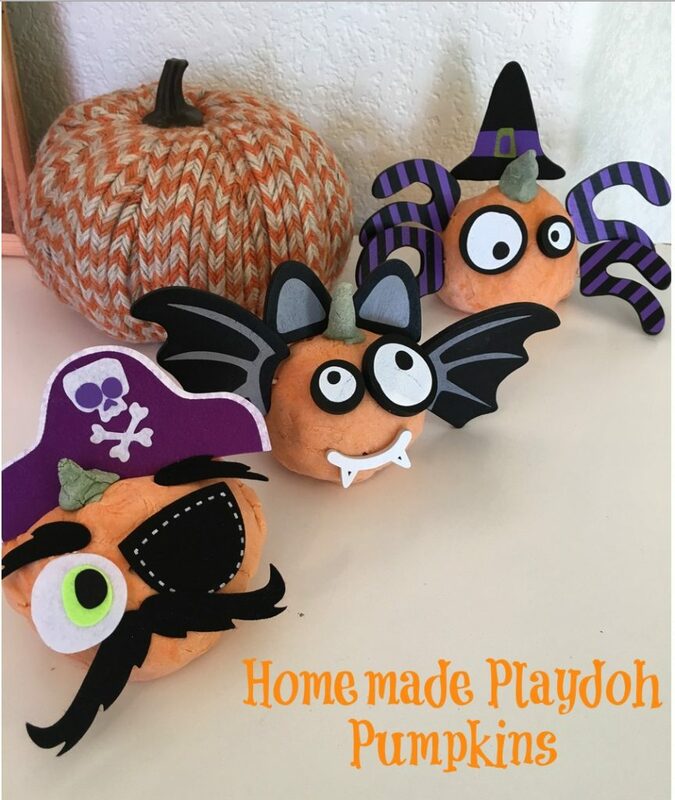 I have never made home made play-doh before but I am going to try it,my kids want to make the cute pumpkins! i used to make play doh when my kids were younger. Cute idea! It's been awhile since I've made homemade play dough. I have not made homemade play doh but would like to. We have not and I would like the pumpkin. Yes, I have made homemade play-doh when my kids were young but haven't tried yet for my grandsons, looks fun, thanks! My girls are grown now. Many moons ago I have Girl Scout Troops and we made play doh a few times. One time we made little Christmas ornaments. I haven't made playdoh, but my kids and my grandkids all like playing with the store bought. I bet they would like making it, too. I used to make homemade play-doh for my students when I was teaching. We make our own playdoh on a pretty regular basis. My daughter likes making her own colors. I know she would like to make all of these characters, but I would be the monkey would be her favorite. I have made play doh before, but it was many years ago. Now I'll be making it fir the grands. Yes, I have made it before on my own and with preschoolers at my job. I've never made my own playdoh, but now I think I will! Thanks for this recipe; what a fun craft to do with my 2 Grandkids! I especially like the Mummy and the Vampire Bat! I've never made homemade play-doh before. My kids would love making pirate pumpkins! I have made play doh before, but it was many years ago.and now my daughters makes it for my grandkids. No, never made homemade playdoh but sounds like fun. My daughter loves to make shapes of animals. I've never made anything like this before, but would love to. Yes, we make home made play doh a lot. I've never made home made doh but I think my littlest would love it!!! I've never made homemade playdoh before. Dd would love making the spider or the bat! No, we've never made playdoh at home before. I'm sure that they would love this though! We have not made homemade Play Doh Before! I have made homemade playdough, we like to made food shapes and shapes. I never made home made-play doh. My boys love trains, cars, and bats. 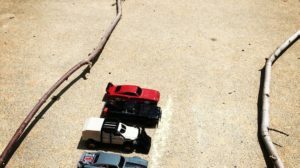 We have not done this yet but this looks fun for the kids. I've never made it before but a friend of mine did and it was koolaid scented. I think my kids would make play food. Yes we like play-doh and we like to make dragons. This is really cool. We have made this before and I think your idea is awesome. With all the idiots out there, we were thinking of having a Halloween craft party and this is perfect! Love it! Yes, I used to make homemade playdoh all the time when my boys were small. yes we made it as a kid, haven't done it with my child yet we just buy it from the store. I have never made homemade playdoh before, but my kids absolutely love the regular stuff! :) I definitely can't wait to try it, thanks for sharing! I have made playdough before and the kids just loved it! I like trying different ways to make it. Some were more successful than others.